When Justin Trudeau looks in the foreign policy mirror who does he see? Someone very much like Stephen Harper. On the world stage Canada under Trudeau the Second has acted almost the same as when Harper was prime minister. The Liberals have followed the previous government’s posture on issues ranging from militarism to Russia, nuclear weapons to the Gulf monarchies. Aping the ancien régime’s position, the Liberals recently voted against UN nuclear disarmament efforts supported by most countries of the world. As such, they’ve refused to attend the ongoing Conference to Negotiate a Legally Binding Instrument to Prohibit Nuclear Weapons, Leading Towards their Total Elimination. Earlier this month the Liberals released a defence policy that calls for 605 more special forces, which have carried out numerous violent covert missions abroad. During the 2015 election campaign defence minister Jason Kenney said if re-elected the Conservatives would add 665 members to the Canadian Armed Forces Special Operations Command over seven years. The government’s recent defence policy also includes a plan to acquire armed drones, for which the Conservatives had expressed support. Additionally, the Liberals re-stated the previous government’s commitment to spend upwards of one hundred billion dollars on new fighter jets and naval ships. Initiated by the Conservatives, last year the Liberals signed off on a government-contracted $15 billion Light Armoured Vehicle sale to Saudi Arabia. Trudeau has also maintained the Harper created Canada-Gulf Cooperation Council Dialogue, which is a platform for foreign ministers to discuss economic ties and the conflicts in Syria, Iraq and Yemen. The GCC includes the monarchies of Saudi Arabia, United Arab Emirates, Bahrain, Oman, Qatar and Kuwait, which have almost all intervened in the devastating Saudi-led war in Yemen. The Trudeau government has continued to isolate Canada from world opinion on Palestinian rights. They’ve voted against numerous UN resolutions supported by almost the entire world upholding Palestinian rights. The Harper regime repeatedly attacked Venezuela’s elected government and in recent weeks the Liberals have picked up from where they left off. The Liberals have supported efforts to condemn the Nicolás Maduro government at the Organization of American States and promoted an international mediation designed to weaken Venezuela’s leftist government (all the while staying mum about Brazil’s imposed president and far worse human rights violations in Mexico). In March the Liberals renewed Canada’s military “training” mission in the Ukraine, which has emboldened far-right militarists responsible for hundreds of deaths in the east of that country. In fact, Trudeau has significantly bolstered Canada’s military presence on Russia’s doorstep. Simultaneously, the Trudeau government has maintained Harper’s sanctions regime against Russia. Nearly two years into their mandate the Liberals haven’t restarted diplomatic relations with Iran or removed that country from Canada’s state sponsor of terrorism list (Syria is the only other country on the list). Nor has the Trudeau regime adopted any measure to restrict public support for Canadian mining companies found responsible for significant abuses abroad. With regards to Canada’s massive and controversial international mining industry, it has been status quo ante. A recent cover of Canadian Dimension magazine provided a cheeky challenge to Trudeau’s bait and switch. Below the word “SURPRISE!” it showed a Justin Trudeau mask being removed to reveal Stephen Harper. The sober reality is that Trudeau represents a continuation of his predecessor’s foreign policy. I might even need to redo my 2012 book The Ugly Canadian, but this time with the tagline “Justin Trudeau’s foreign policy”. Every year the Royal Canadian Legion sells about 20 million red poppies in the lead-up to Remembrance Day. Remember that red poppies were inspired by the 1915 poem “In Flanders Fields” by Canadian army officer John McCrae. The pro-war poem calls on Canadians to “take up our quarrel with the foe” and was used to promote war bonds and recruit soldiers during World War I. Remember that today, red poppies commemorate Canadians who have died at war. Not being commemorated are the Afghans, or Libyans killed by Canadians in the 2000s, or the Iraqis and Serbians killed in the 1990s, or the Koreans killed in the 1950s, or the Russians, South Africans, Sudanese and others killed before that. By focusing exclusively on “our” side Remembrance Day poppies reinforce a sense that Canada’s cause is righteous. But, Canadian soldiers have only fought in one morally justifiable war: World War II. In 1927 the federal government granted the Legion a monopoly over poppy distribution and the Veterans Affairs-run Vetcraft made the Legion’s poppies for 75 years. The Legion has benefited from various other forms of government support. Its branches have received public funds and the Governor General, head of the Canadian Forces, is the Legion’s Grand Patron and numerous prime ministers and defence ministers have addressed its conventions. The veterans group has sought to suppress critical understanding of military history. In the mid-2000s the Legion battled Canadian War Museum historians over an exhibition about the World War II allied bomber offensive. After shaping its development, the Legion objected to a small part of a multifaceted exhibit, which questioned “the efficacy and the morality of the…massive bombing of Germany’s industrial and civilian targets.” With the museum refusing to give the veterans an effective veto over its exhibit, Legion Magazine called for a boycott. The Legion’s campaign led to hearings by the Senate Subcommittee on Veterans Affairs and a new display that glossed over a bombing campaign explicitly designed to destroy German cities. It also led to the director of the museum, Joe Guerts, resigning. A decade earlier the Legion participated in a campaign to block the three-part series The Valour and the Horror from being rebroadcast or distributed to schools. The 1992 CBC series claimed Canadian soldiers committed unprosecuted war crimes during World War II and that the British-led bomber command killed 600,000 German civilians. The veterans groups’ campaign led to a Senate inquiry, CRTC hearing and lawsuit, as well as a commitment from CBC to not rebroadcast The Valour and the Horror without amendments. Rather than supporting the militaristic, jingoistic, nationalism of the Legion, Canadians of good conscience should support peace organizations’ white poppy campaign to remember all victims of war. A recent Globe and Mail article (reprinted on Rabble.ca) by Gerald Caplan detailing Canadian relations with Uganda made me mad. It was not so much for what’s in the article, but rather what it ignores, which is reality. 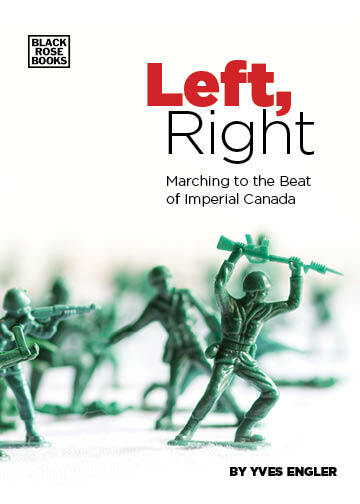 Any progressive author writing about Canada’s foreign affairs betrays his readers if he ignores the bad this country has done and feeds the benevolent Canadian foreign-policy myth. “Canadians have had ties to Uganda for many decades”, writes Caplan, a self-described “Africa scholar” citing the establishment of diplomatic relations soon after independence. He also mentions many Canadians who “found their way to the country” amidst instability and the federal government taking in Asians expelled by Idi Amin. The former NDP strategist points to some private Canadian aid initiatives in the country and details a Canadian lawyer’s contribution to a suit over the Ugandan government’s failure to provide basic maternal health services, which may violate the Constitution. But, Caplan completely ignores the unsavory – and much more consequential – role Canada has played in the East African country. For example, he could have at least mentioned this country’s role during the “scramble for Africa” when Canadians actively participated in subjugating various peoples and stealing their land. This is necessary to acknowledge if we are ever to build a decent foreign policy. In the late 1800s a number of Canadian military men helped survey possible rail routes from the East African Coast to Lake Victoria Nyanza on the border between modern Uganda and Kenya. The objective was to strengthen Britain’s grip over recalcitrant indigenous groups and to better integrate the area into the Empire’s North East Africa-India corridor. British officials subsidized the White Fathers schools as part of a bid to expand the indigenous workforce. Canadians were also part of the British colonial authority. Royal Military College of Canada graduate Godfrey Rhodes became chief engineer and general manager of Kenya and Uganda Railways and Harbours in 1928. The Victoria, BC, native was in Uganda for over a decade and was followed by Walter Bazley, a colonial administrator in Bunyoro from 1950 to 1963 (after Ugandan independence, Bazley joined the Canadian public service). Poussette and future trade representatives helped Canadian companies profit from European rule in Africa. By independence Toronto-based Bata shoes controlled most of the footwear market in Uganda while a decade before the end of British rule Falconbridge acquired a 70% stake in the Kilembe copper-cobalt mine in western Uganda. In a joint partnership with the London controlled Colonial Development Corporation, the Toronto company’s highly profitable mine produced more than $250 million ($1 billion today) worth of copper yet paid no income tax until its capital was fully recovered in 1965. In 1968, post-independence leader Milton Obote increased the country’s copper export tax and then moved to gain majority control of the mine. Falconbridge quickly stripped out $6 million in special dividend payments and threatened to withdraw its management from the country. Although Kilembe Copper was both profitable and socially important in the Ugandan economy, this did not prevent the Falconbridge group from withdrawing capital as rapidly as possible just before president Obote forced it to sell Uganda a controlling interest in 1970. The implication was that its management team would be withdrawn entirely if the government did not restore Falconbridge’s majority ownership. Dislocation in the lives of Ugandan people was a price the company seemed willing to pay in this tug-of-war over the profits from Uganda’s resources. The Kilembe mine also contaminated Elizabeth National Park and tailings seeped into Lake George, near Uganda’s western border with the Congo. While this country’s “Africa scholars” have largely ignored Canada’s position towards Amin’s rise to power, the available documentation suggests Ottawa passively supported the putsch. On three occasions during the early days of the coup (between January 26 and February 3, 1971) the Pierre Trudeau government responded to inquiries from opposition MPs about developments in Uganda and whether Canada would grant diplomatic recognition to the new regime. Within a week of Obote’s ouster, both External Affairs Minister Mitchell Sharp and Prime Minister Trudeau passed up these opportunities to denounce Amin’s usurpation of power. They remained silent as Amin suspended various provisions of the Ugandan Constitution and declared himself President, Commander in Chief of the Armed Forces, Army Chief of Staff and Chief of Air Staff. They failed to condemn a leader, now infamous, for plunging the nation into a torrent of violence. But, just in case you think it’s just our unsavoury history that Caplan ignores, there’s more. He also also ignores more recent developments such as SNC Lavalin’s alleged bribery in the country, Montréal-based Canarail’s contribution to a disastrous World Bank sponsored privatization of the Kenya and Uganda railway systems or Ottawa’s “logistical support and some funding for the Uganda led [military] force” dispatched to Somalia to do Washington’s dirty work. Why did this article make me so mad? Because it’s part of a pattern of the social democratic Left ignoring how Canadian corporations and governments impoverish the Global South. Too often social democrat intellectuals dim, rather than enlighten, progressives’ understanding of Canada’s role in the world. To preserve his position at the Globe and Mail and CBC Caplan may feel he needs to feed the benevolent Canadian foreign-policy myth. But, he should at least show some decency and spare Rabble.ca from this nonsense.